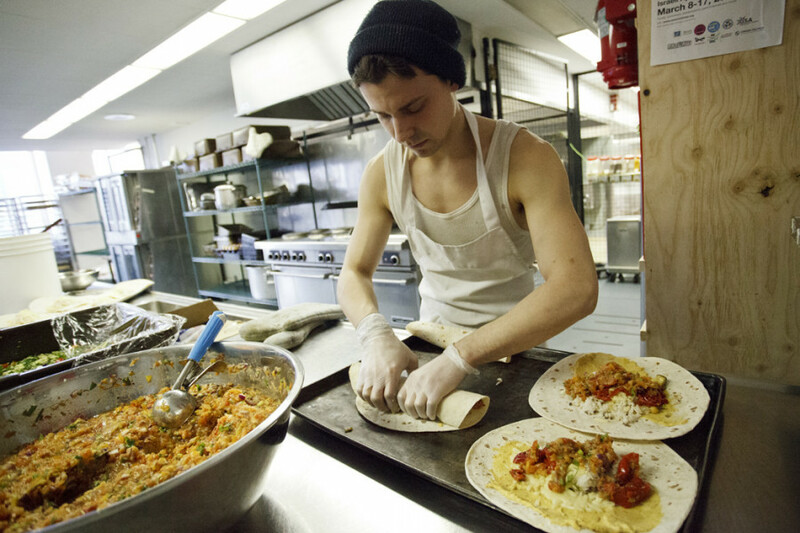 People’s Potato volunteers prepared burritos with a revolutionary zest Tuesday afternoon. Photo Shaun Michaud. The homey smells of red peppers and toasting wraps in the People’s Potato had a revolutionary zest Tuesday night. The wraps and burritos were made specifically to be distributed to protestors at the planned anti-austerity demonstration that night. People tend to stay at protests longer if they have something to eat, Potato volunteer Guillaume Poirier told The Link. It falls within the People’s Potato mandate to support the strike because they’re anti-capitalist. “Anything linked to austerity is against us,” Poirier explained. While computer science student Tim Forbes isn’t particularly involved in the anti-austerity movement, he had happily come “to help make food for people that need it,” he said in between sprinkling handfuls of cheese on a wrap. Some volunteers were a bit more ideologically motivated. Though protestors getting tear-gassed in the streets may seem far removed from the calm and amicable kitchen atmosphere, the People’s Potato is rooted in the sort of dissent which pushes demonstrators to action. “The very beginning of the Potato was all about that- helping students that are poor because of the loan system to eat well,” Poirier concluded.